Location: St. Augustine Street, D8. Staycity Serviced Apartments Dublin Saint Augustine St are modern spacious self catering apartments in the Liberties area of Dublin. They come in one, two and three bedroom sizes and have balconies which overlook either the city or the courtyard. They are located within a few minutes walk of Ushers Quay, The Liffey and Christchurch Cathedral. These apartments are fully furnished with sofas, well-equipped kitchens and dining area and washing machines and dishwashers are provided. There is free Wi-Fi internet access LCD TVs and DVD players. Rooms at Staycity Apartments – Saint Augustine St. There is a choice of One-Bedroom Apartments (sleeps 3) or Two-Bedroom Apartments (sleeps 5) or Three-Bedroom Apartments (sleeps 7) including a Penthouse Apartment. One Bedroom: Choice of 1 double bed or 2 single beds. Sofa bed in the lounge area. Two Bedrooms: Choice of 2 double beds or 1 double bed and 2 single beds or 4 single beds. Sofa bed in the lounge area. 1 double bed and 4 single beds or 6 single beds. Sofa bed in the lounge area. Beds have crisp linen sheets and the bathrooms feature both baths and showers. Around the corner from the Staycity apartments is the Brazen Head, Dublin’s oldest pub, which is thought to date back to 1198. Temple Bar, Grafton Street and the Guinness Storehouse are no more than a 10-minute walk away. 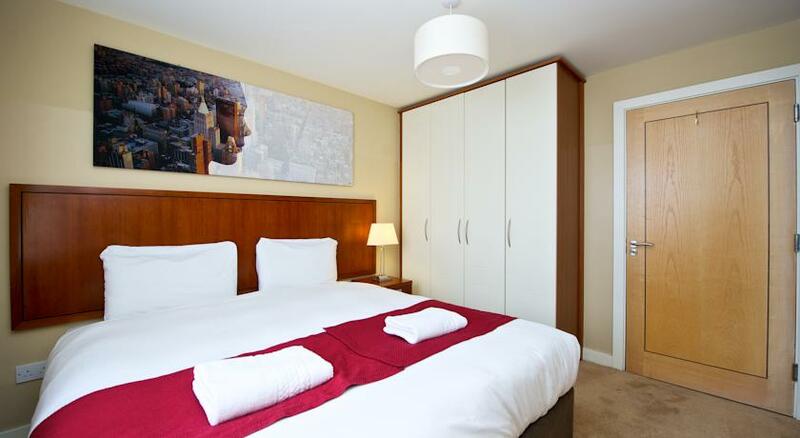 Heuston Train Station is only 0.7 miles from Staycity Serviced Apartments. Christchurch Cathedral, The National College of Art and Design and Ushers Quay are about 3 minute walk.